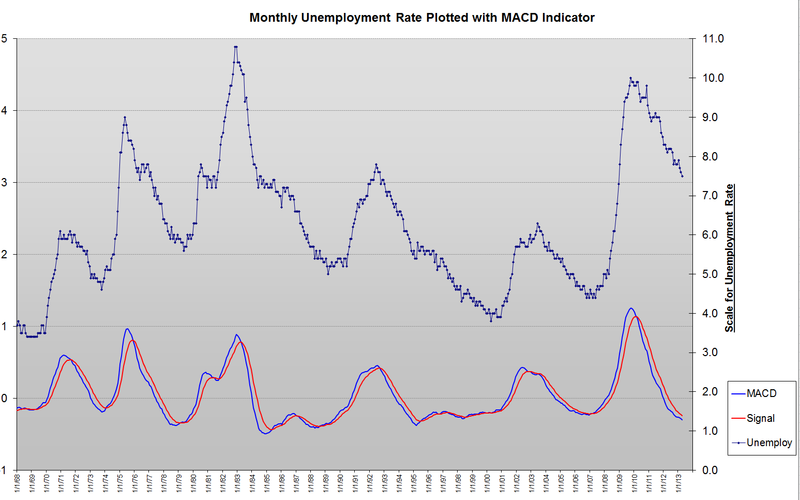 Over the weekend for fun (yes I'm a nerd I guess) I downloaded the monthly unemployment rate data from the Government Website (Fred) added it to Excel and I also added a MACD Indicator. My thought has always been that trends in economic data can be predicted using standard Stocktrading indicators like MACD, Stochastics, RSI etc. The unemployment rate especially because it tends to trend for long periods of time vs changing direction suddenly. As you can see simple MACD crosses work well, but also typical positive and negative divergences form on the MACD just like they do for Stocks and indexes. I found that using my confirmation method (which I discussed in my weekend newsletter) to confirm a MACD cross really catches the trends well and filters out the divergence. Again this chart has nothing to do with predicting the stockmarket at this time, I'm simply showing you a little project that I did on the weekend. I would also like to take other economic data such as Housing data, ADP etc and create similar plots. I bet if I took housing data for the last decade that we would have seen clear negative divergence and a clear sell signal in housing prices in 2005 or 2006.